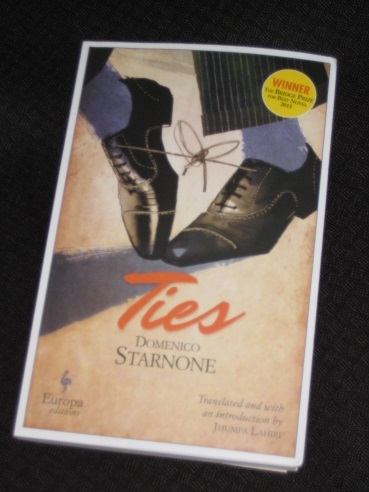 Domenico Starnone’s Ties (translated, and with an introduction, by Jhumpa Lahiri, review copy courtesy of Europa Editions) is a short novel in three parts, each telling the story of a relationship from a different angle. In the first, a young wife, Vanda, writes letters to her husband, Aldo, who has run off with a nineteen-year-old student, leaving his wife and two kids to fend for themselves. Over the course of Vanda’s pleas for her husband to return, we learn of the hardships she faces, both emotional and practical, after being deserted, before she eventually gives up and settles down to life without him. While fairly short, Ties is a cleverly constructed, entertaining read. The reader is treated to both sides of the couple’s history before encountering a third section, a sort of coda, that sheds further light on certain aspects of the story. Starnone is a successful writer in his home country, having won the prestigious Strega Prize for an earlier work, and this novel was the winner of another award, The Bridge Prize, in 2015. However, he’s not the only big name involved here as there’s a fair chance (unusually) that you’ll have heard of the translator too. This is Lahiri’s first attempt at translating a novel from the Italian (I looked at her initial adventures in the language last year), and overall it made for a smooth read, with each of the three sections having its own distinct style. You explained that just as your father had damaged all of you, so you – since the ghost of that unhappy man who made you all unhappy still torments you – were afraid of damaging Sandro, Anna and, most of all, me. See how I didn’t miss a word of it? Between the lines, we learn of Aldo’s half-hearted efforts to stay in touch with the kids, especially sporadic once he moves to Rome. He drifts in and out of the family’s lives until Vanda finally loses patience and draws a line under a painful period of her life. The majority of the novel then focuses on Aldo’s rediscovery of the letters when cleaning the house after a suspected break-in. There are (at least) two sides to every story, and it’s here that we get to hear his account of the decision to break free and start anew. What emerges is a portrait of a weak man influenced by the era he was living in, infected with a belief that marriage was outdated and restrictive, and as a young professor at a university, he was only too happy to have his head turned by young women. Of course, his accounts of Vanda’s behaviour at the time of their separation are rather different to hers, showing a picture of a hysterical, crazed woman. Sitting in the middle of the ruins of his home (an apt metaphor for his crumbling life…), Aldo is forced to reconsider the actions he took back in the seventies, wondering if he really was acting for the best. Now, keen readers may have realised that this novel, especially the first part, sounds rather familiar, and it’s very hard for those who have read the book not to associate Vanda with Olga from Elena Ferrante’s The Days of Abandonment, another novel in which a wife goes crazy after her husband runs off with a young woman. Both books feature a woman left behind with two kids and a heap of financial worries; both women (natives of Naples) are prone to hysterical outbursts and bouts of nocturnal letter writing to their lecturer husband; both stories are set in the summer, with all the neighbours (except one…) gone, leaving them friendless and helpless. I reread the Ferrante book before my second run-through of Ties, and the parallels between the works are unmistakable – even the titles, deliberate opposites, seem to be playing off each other. There’s an overwhelming feeling that these parallels are deliberate. The Days of Abandonment finishes months after the husband’s betrayal, and Ties appears to be a reaction, a response, to that novel, in which the husband has his say (it could also be seen as a continuation, showing what *really* happened next). If it’s a work which aims to make us sympathise with the man, though, it’s certainly not a success as the justifications he presents ring rather false for the most part. But why should Starnone pay homage to (or poke fun at) Ferrante’s novel? Well, that’s where the speculation comes in. You see, one of the prime candidates for the real name behind the shadowy pseudonym is Starnone himself, which would means that Ties is a clever piece of meta-fiction in which one of the writer’s personas is playing off the other. However, the most recent Ferrante suggestion, and one that many people now believe to be the truth, is academic and translator Anita Raja, who just happens to be married to… Domenico Starnone! Raja was allegedly ‘outed’ by a rather nasty investigation using financial records, and in fact an article published in The Australian newspaper a couple of months back claims that Ferrante’s works are actually the result of a joint effort between the couple. I first read Ties a few months back, just before the Man Booker International Prize longlist was revealed. I wasn’t overly impressed at the time and didn’t get the time to review it before I had to dive into a new round of reading. However, I’m actually glad now that I waited before posting on it. On its own, Starnone’s novel is a short, interesting read, notable just as much for Lahiri’s involvement as for the content. When read in conjunction with The Days of Abandonment (and the latest gossip), though, it becomes a far more intriguing endeavour. So, should you treat it as just another book, or approach it through the lens of the Ferrante rumour mill? Very interesting and subtle review, Tony. You outdid yourself this time! If only we knew the truth! Fascinating stuff, which makes me want to read Ties (having read Days of Abandonment). I really enjoyed this novel. I can be a bit of a wimp when it comes to disjointed narratives and different points of view, but I loved it here. As someone who likes to always be in control, I was drawn to the out of control nature of so many the actors in this drama. Seemed like everyone was a bit unglued. I’ve never read Ferrante. Is the writing style similar?